I love cheese. There, I said it. When recipes say “sprinkle” cheese, I COVER it in cheese. Cheese is just awesome. One of my favorite foods that involve cheese is fondue! Whenever I go out for fondue, which is rare, I go crazy on the cheese fondue. It’s so fluffy, stringy and warm..oh, nom nom nom! Sadly, hubs hates fondue. He can’t stand it. So, I do not own a fondue set. It would be really useless to own a set knowing that I’m only going to eat off of it. For the party, I wanted to bring in a dangerously cheesy dish, and what is more cheesy than fondue? I searched the Internet like crazy, and found a recipe that sounded simple and had great reviews. I wanted something that tasted like it came straight from a restaurant, so I wanted it to be authentic and have a swiss cheese base. I also knew fondue involved wine, and I will admit, I am the furthest away from being knowledgeable about wine. I need things spelled out for me in a recipe. “Dry White Wine” as an ingredient in a recipe didn’t help me, so I asked a few friends for help. It was a toss-up between using a sauvignon blanc and an unoaked chardonnay. My cheap self couldn’t find an unoaked chardonnay for less than $10 (at least the label didn’t say unoaked), so I settled for some Barefoot Sauvignon Blanc ($6 a bottle and it had seemingly good reviews for a frugal wine on the Internet). In the end, I couldn’t even taste the wine. I just don’t have a sensitive palate, I guess..all I tasted was cheese, cheese, cheese! 🙂 This dish was a HIT! Simmer wine in a small pot. Add Swiss cheese, Gruyere cheese, 1/4 pound at a time. Stir after each addition of cheese until melted. Note: It might not look like it’s coming together at this point. Just keep stirring and add the flour. That’s when my fondue came together. Stir in flour. When all the cheese has melted, stir in salt. Place in a small crockpot on low heat to serve. Serve with bread cubes, broccoli, carrots and apples. Sounds delicious! 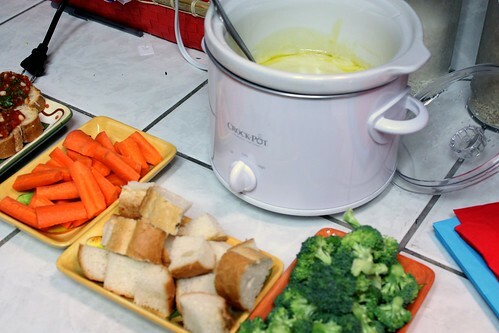 I’ve always wanted to make fondue, but we don’t have a small crockpot to keep it warm in. OMG WANT! I need this in my belleh now! Hai, my name is Stephanie and I’m a cheese addict. I’m also a carb addict. Ooey-gooey melted cheese + yummy bread to dip in it = my heaven. Thanks for sharing this recipe and for spelling out the whole wine thing. I also need more direction than the usual “red wine” or “dry white wine”, etc. I’ve tried using various different pots but it didn’t work so well for me (the cheese kept getting burning on the bottom). In the end I just bought a fondue set and they’re not all that expensive anyway. I will definitely be trying this recipe when I next make fondue.